Today was my anticipated trip to the Southwest Florida Water Management District's, Stormwater Treatment site #5 . Only organized, guided tours are permitted at this time to access the property for birding. Therefore I had contacted the Hendry - Glades Audubon Society to make a reservation to attend today's tour. STA5 is located about twenty miles south of Clewiston, and is about two hours from home. Today I am joined by my daughter Katie, who took many of these photos. On the trip over we spotted a pair of Scissor-tailed Flycatchers, a trio of Crested Caracaras and a Broad-winged Hawk. Had a report of a sighting of a white-tailed kite near STA5 and were watching for any newly arrived swallow-tailed kites. But no kites today though. The tour today was very crowded. I believe there was a count of 83 people. So some of us were allowed to free-lance. We quickly found Purple Gallinules, a Purple Swamphen, hundreds of American Coots, Common Moorhens, Greater and Lesser Yellowlegs. Can add both Black-bellied Whistling Ducks and Fulvous Whistling Ducks. This time of the year wintering waterfowl are common, especially the coots. Today we located Blue-winged Teal, American Wigeons, Northern Shovelers, Mottled Ducks, Lesser Scaups and Ring-necked Ducks. Also had American White Pelicans, Caspian Terns, Pied-billed Grebes, Anhingas and Double-creasted Cormorants. A few months ago a great cormorant was found here. Also can count about 35 Roseate Spoonbills, over 40 Limpkins and a couple of hundred Black Skimmers. Were able to add Least Sandpipers, Dunlins, Long-billed Dowitchers and Black-necked Stilts. Had all of the waders, including an American Bittern. Lots of Northern Harriers seen working the marshes, also three Snail Kites, a Merlin, Peregrine Falcon and several American Kestrels. Had several Savannah Sparrows and a suspect swamp sparrow. Best sighting of the day was the wintering Cassin's Kingbird. This same bird was seen here last year in the exact same location as today's sighting. The cassin's is a western bird not commonly seen in Florida. Lots of alligators seen everywhere. A very docile Florida Garter Snake found sunning itself on the road had to be moved to proceed. And large Snapping Turtle was found basking beside a canal. After three hours it was time to head home. Passed through Clewiston and Alva on the way and was able to add White-winged Doves and Indigo Buntings at the Alva bird feeders and Brown-headed Cowbirds in Clewiston. Headed south to Eagle Lakes Community Park in Collier County. Behind the ballfields are the mitigation ponds for reclaimed waste water. This is also an excellent place to bird for Florida wetland species. Saw about all of the expected wading birds including a Limpkin, dozens of Wood Storks a Black-crowned Nightheron and many Glossy Ibis. For water fowl we only had Blue-winged Teal, Mottled Ducks and few Coots present. Other interesting species present was a Northern Flicker, a juvenile Bald Eagle and a young Red-shouldered Hawk molting into adult plumage. Hundreds of Tree Swallows swirled above the lakes and I made an effort to try and see if any purple martnis could be found as well. But not today. A couple of glimpse of a possible merlin, but never got a good look. Was hoping to possiblely locate a king rail or a bronzed cowbird. Really did not expect the rail, but bronzed cowbirds were a really possibility here. Finally was able to make a trip over to Dade County and Everglades National Park. The semi-tropical environment of South Florida can offer a great variety of wildlife not found elsewhere in the United States. Ironically, because of my close proximity to all these Florida specialities, I find myself calculating trips to other places like the Rio Grande Valley or the Maine Coast for their specialities. Today I was interested in finding purple galluniles, short-tailed hawks, white-tailed kites, common mynas, swainsen's hawks, smooth-billed ani, scissor-tailed flycatchers and others. Made several stops including Florida City, Homestead and Lucky Hammock outside of the park. These locations were not very fruitful with misses on the scissor-tail flycatcher in Florida City and on the raptors and sparrows at Lucky Hammock. Did get a Limpkin and a Cooper's Hawk in Florida City though. One success at Lucky hammock was locating the Brown-crested Flycatcher being reported there in the company of Great Crested Flycatchers. Also had a hunting Northern Harrier. White-eyed Vireos were seen or heard at virually every stop made in the park and Lucky Hammock. The Common Mynas were usually an easy find in Homestead but I had to do a bit of searching today. Aside from the Anhinga Trail and Flamingo, the stops in the park were a bit disappointing. THE ANHINGA TRAIL - as usual the Anhinga trail was a great location for finding and photographing Florida wildlife with dozens of Alligators and nesting Anhingas. Purple Gallinules were plentiful along with all the usual waders. Missed here was the possibility of locating a rather secrative smooth-billed ani that has been seen on the trail recently. The award-winning wildlife photographer, Bob Pelkey was invited to come-along today, but had to pass because of work. He would have spent his entire day on his craft with all of the photographic opportunities the Anhinga Trail offers. FLAMINGO is the southern terminus of the highway through the park and can offer sightings of lesser nighthawks, short-eared owls and shiny cowbirds. The bay may have various gulls, terns, shorebirds and white pelicans. Today the Eco Pond was quite with only a pair of Great Egrets. Walked the perimeter looking for painted buntings or yellow warblers, but not today. Did sight a soaring Bald Eagle and several Ospreys. I can also add a Red-tailed Hawk, a Broad-winged Hawk, several American Kestrels, a young Red-shouldered Hawk and a Peregrine Falcon in the vacinity. Found a cooperative White-winged Dove and a couple of American Crocodiles were found in the canal by the marina. Everglades Outpost, operated by Bob Freer, is located outside Everglades National Park in Homestead. Some of their rescues have been features on "Miami Animal Police" on the Animal Plant network, and on the History Channels' "Monster Quest"
I could not get up to Pasco County when reports of some interesting birds were coming to light. Missed on the suspected Kelp Gull being observed at Ancolate Gulf County Park in Tarpon Springs. 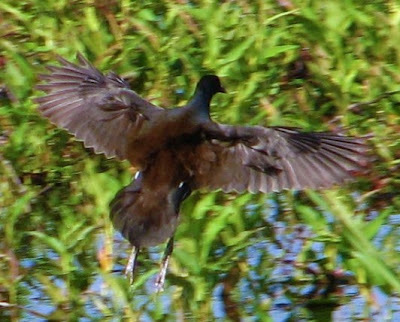 But the white-faced ibis could possibly still be found in New Port Richey. I was also interested in exploring the area as my grandparents moved to New Port Richey back around 1964. They had purchased and operated a small road-side motel on US19. My family would spend vacation time in Florida every year visiting my grandparents here. I recall the area was rather rural and quite, but was growing with developments targeting the retirement population. Many memories include spending days at Hudson Beach getting sunburned, and catching blowfish and sea horses in the rocks, and a deep-sea fishing trip out of Tarpon Springs and the sponge docks there as well. Much of the area was being bulldozed and reshaped for development. A few blocks﻿﻿ from grandma's house, one such site, provided me with the only arrowhead I ever found, and still have, just sitting atop the disturbed soil. back in 1969 was the first time I ever saw a Wood Stork and back then the area had a large population of wild Budgies. I remember my Grandma's comments about seeing trees filled with the birds. Currently they maybe be gone. As other exotic bird species have pushed them out. Gone too is the rural, quite settings I remembered. One location I searched was Autin Road near Dade City. A rural area with pastures, farms and parks. Observed a large flock of Sandhill Cranes that had to contain at least seventy individuals. Other interesting sitings included several Wilson's Snipes, a pair of beautiful Red-Tailed Hawks and Eastern Bluebirds. At the wooded intersection of River Road and Autin Road I was lucky to find a mixed flock of Carolina Chickadees, White-eyed Vireos, Red-belled Woodpeckers, Yellow-rumped Warblers, Black-and-White Warblers, Tufted Titmouse and Blue-gray Gnatcatcher. Next headed over to Mitchell Blvd in New Port Richey were a white-faced ibis had been sited for a few weeks. I checked the location twice, but no white-faced ibis. In fact I did not see any glossy ibis in the whole county. The ponds had cooperative Mottled Ducks, Pied-billed Grebes, a Sandhill Crane, Palm Warblers and a Savannah Sparrow. At nearby Trinity Blvd. I did locate a trio of Nanday Parakeets. Next was Anclote Gulf Park in Tarpon Springs. Last month the place was all a buzz by the presence of a suspected kelp gull. This gull is native to the southern hemisphere. So out of curiosity I made my way here. Sited along the road prior to arriving here I spotted two Bald Eagles, a couple of Ospreys and a Cooper's Hawk. The tide was high on my arrival so no gulls or terns resting on the flats, but several Common Loons were fishing on the north side of the fishing pier. From the river side of the pier were an Anhinga, several Double-crested Cormorants and at least twenty four Horned Grebes. The best looks at these I grebes I have had so far. ﻿﻿﻿﻿ ﻿﻿ From the parking area were large numbers of Grackles, Red-winged Blackbirds, Ground Doves, Eurasian Collared Doves and a small flock of Monk Parakeets. ﻿ On the way home I made a stop at the Terra Verde ponds north of Ft DeSota park in Pinellis County. Found an American Wigeon, a few Northern Shoveler, hundreds of Redhead, plus Ring-necked Duck, Lesser Scaup, Pied-billed Grebe, Brown Pelican, Double-crested Cormorant, Great Egret, Laughing Gull, and few more Monk Parakeets. Next made a quick stop at East Beach in Ft DeSota Park were I added Red-breasted Merganser, more Common Loons and Anhingas. Elected to bird Harn's Marsh and Alva this morning. It was a nice day especially compared to the heavy snows and cold weather our family and friends are experiencing up-north. Began the day with a stop on nearby Domestic Street to check the ponds for ducks and the shrub for sparrows. Found the ponds much emptier than expected. 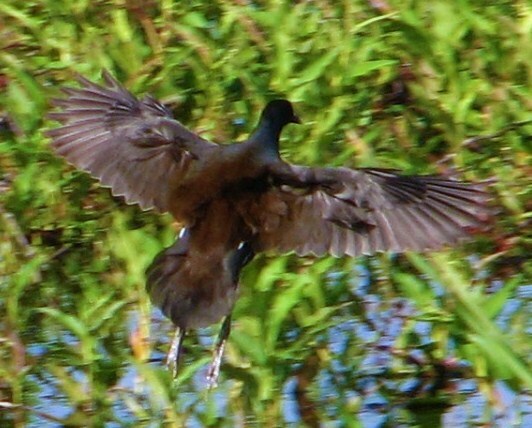 Not as many American Coots were present as I have noticed these past few weeks, and no ducks. Perhaps later in the mourning they will arrive. And no sparrows. A few Palm Warblers and a calling Eastern Meadowlark were noted. Had to stop at the bank by the I-75 rest stop area, which gave me an opportunity for a quick check of the wetlands located there and got to see Greater and a Lesser Yellowlegs fly-in. From here headed to Alva to look for woodpeckers and buntings. Stopped by the Hickey Creek Preserve, which was on the way, to check for any red-headed woodpeckers and Florida scrub jays. Did not see the woodpecker or jays but had great views of Eastern Phoebes and Pine Warblers. I have had very few successful results from trying to photograph small, active birds like warblers. Just have a point and shoot camera. So I was happy with the results of the pine warblers photos, as they let me get close enough and would pose long enough for the shot. Stopped by the White's house in Alva to view their feeders and the gracious Mr White came out to say hello. Noted the many Painted and Indigo Buntings present along with a trio of White-winged Doves. Didn't see any goldfinch's, but Mr White did assure me that they were still around. Red-headed Woodpecker found in Alva, Florida. Came across this huge ball of swirling Tree Swallows as I came into LeHigh Acres. Could of been a thousand birds. As I arrived at Harn's Marsh I could see that hundreds of Tree Swallows were present as well. The water was higher than on my last visit, and I not sure if it had an effect on the Snail Kites Just that they seemed less numerous as I only saw two from a distance. If the apple snails they consume diminish, the kites will spread out. But the Limpkins, who also survive on apple snails, were very numerous today. I will eventually add a page on this blog with directions to my favorite birding spots in southwest Florida, as I have meet several people who were visiting Harn's Marsh for the first time complaining on how hard it is to find. I believe that Lee County is working on plans to develop this location for better public access. A good idea as I have met birders from all over the USA, Canada and overseas. Maybe we could look at developing something like The Celery Fields in Sarasota.